208 – Improving service operations. Implement with motivational interviewing. Earlier posts have described how to improve service operations by developing a service action plan and redesigning services. This post looks at how to implement a redesigned service. You may have noticed that not everyone is excited by the prospect of change. Having said that, some people like change. Others could be frustrated by the current situation. These people could be innovators or early adopters who will readily accept the need to change. The Rogers Innovation Diffusion Curve shows the rate at which a new idea spreads through a group. 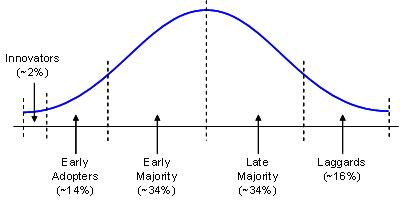 In any group contemplating change you are likely to have people from each of the groups identified on the curve. Some are going to accept the change more easily than others.